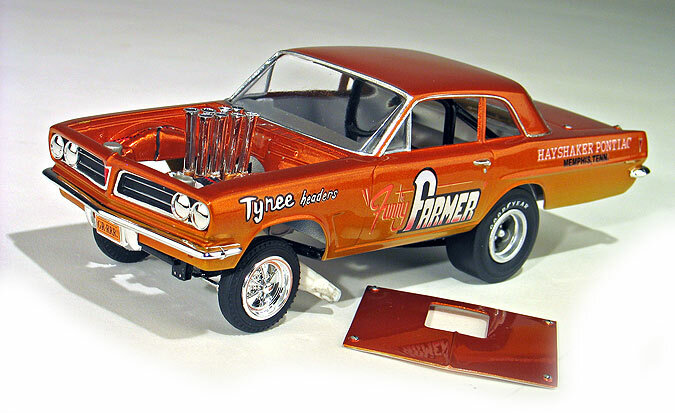 Another box art project I recently did for Model King was this version of the AMT '63 altered wheel base Pontiac Tempest kit. The project came about from Dave Burket who wanted to do a special release of this kit with new box art, so I came up with what I thought would be a fun idea. Back in the '60's when this kit was first issued, AMT did a series of "art" boxes that featured no graphics on the box tops, just art work. I thought this would be a great opportunity to bring back the idea and update it as a sort of tribute to the original kit. Most people think this kit is a replica of the Arnie Beswick "Tameless Tiger", and while there are a lot of similarities (and it's a good starting point for a replica) there is enough differences that myself and Dave thought this kit should have it's own identity. We tossed around several ideas for colors that would work with the kit's decals and ended up choosing to go with an orange color scheme as a nod to the original box art, but I thought I could jazz it up a bit with a multi-hued candy flake paint job. For my box art model, I painted it House of Kolor candy orange along the top that fades to gold along the sides. The model itself was built right out of the box. It's a simple kit to build and I think it looks really cool with a little bit of effort. I really like the rough and rowdy look these vintage drag cars have. They were down right dangerous. For the box top I wanted to do an illustration capturing the car in a typical scene from the sixties - so I painted it wheels up, locked in combat, and right at the moment the light turns green. 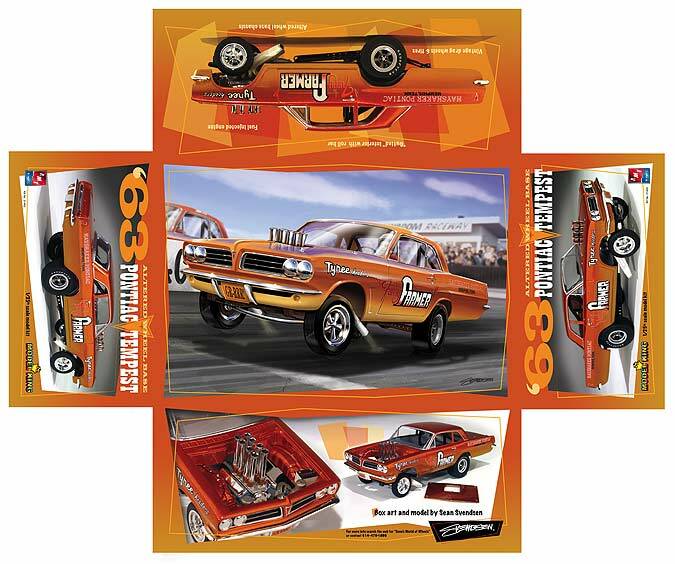 I continued the orange to gold paint scheme on the rest of the box art and used a geometric shape background motif that was popular back in the mid-sixties. I always thought of these match racers as sort of a drag racing equivalent of the old west gunslingers so for the typography I used some sixties looking cowboy fonts which seemed appropriate to me. 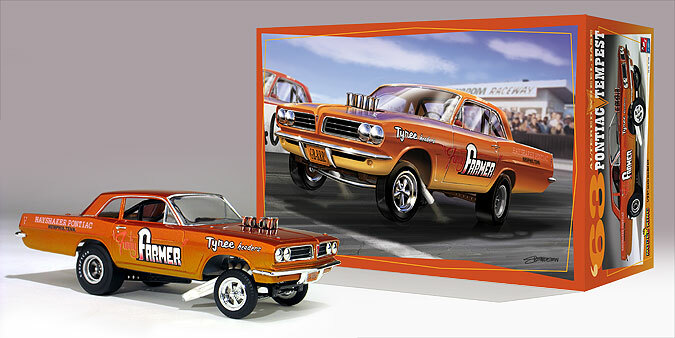 See other car illustration work I've done.